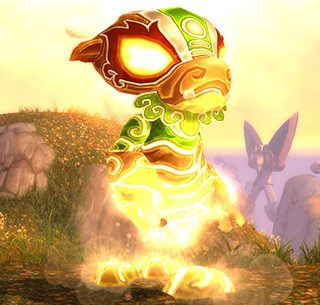 The Thundering Pandaren Earth Spirit is located in Kun-lai Summit at 64,93. His Team consists of Darnak and Sludgy. Your team :Darkmoon Rabbit ( or any rabit with burrow and dodge, I prefer the Darkmoon Rabbit because of the bleed it sets), Emerald protowhelp, and Darkmoon Zepplin. Let the battle begin! Pandaren Earth Spirit starts with crystal prison, but that doesnt matter because your rabbit is faster and starts with burrow. he retaliates with Stone shot, but your under ground so its negated. As you pop up, the next move is dodge. Critters lose thier crowd control effects very quickly if they even get them at all, so a rabbit is a great pet to use against this CC Opponent. here you just wear him down, keeping dodge and burrow on CD, and before you know it, ashes to ashes, dust to dust. AMEN. Sludgy is magical, so its time to go get the magic killer we all know and love, the Emerald proto-whelp. This thing is loaded! protostrike, dragon breath, bucket seats, air conditioning.. you get the picture. Hes my favoite magic killer yet. Start with Proto strike, then follo wup with breath, heal if you have to then just keep bouncing between protostrike and breath. 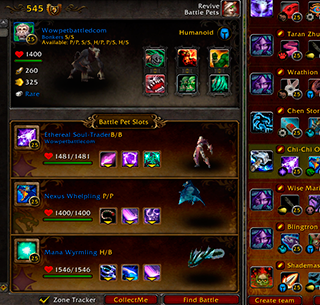 Darnak hits really hard, but he has alot of maintenance, refreshing his stone skin and burrowing. So we have plenty of time to set up with the Zeplin, First move is Decoy. Then its just bombing run and missle spam. You have to time it as he first ups his armor, then attacks, or attacks outright, either way, hit him with bombing run first so it connects.